When we’re ill, it’s a blessing to be surrounded by people who understand how to help a sick friend. The best way to have those people in your life? Be one of them yourself! Whether you’ve just learned your best friend has the flu or found out that the woman who sometimes gives your kid a ride home after soccer practice is recovering from surgery, looking for ways you can help is a kindness you do not only for them but also for yourself. Being a parent is hard enough, but being sick and having no one to turn to is miserable. I should know: a few months after my husband passed away I injured my back horribly. My adult daughter had just moved 5 hours to the east, while the rest of my family lives 11 hours to the south. If it weren’t for the kindness of several of my girlfriends who know how to help a sick friend, I don’t know how my son (who wasn’t yet driving) would’ve got to and from school. Were it not for them, we’d have been living on ramen and pizza delivery, in a sordid mess, and probably sniping at each other constantly from spending too much time together. The things below are some of the incredible favors my friends did. Now when I learn that a friend is ailing — even if it’s something as minor as a nasty cold or sprained ankle — I remember this list and do what I can to help. Because that’s what friendship is all about: helping each other how we can, when we can, in gratitude that we’re fortunate enough to know each other. One thing I’ve learned, during my husband’s battle with cancer as well as the times I’ve been sick myself, is that asking “Is there anything I can do?” just burdens the other person. If they’re not feeling well, they may not have the energy to think up ideas. Plus, who wants to ignore how awful they’re feeling to think of things they need help with only to hear “Oh, I’m sorry, I’m busy that day” or that whatever they’d asked for isn’t the kind of help you’d intended? Instead, look at this list and pick a few things you have the time and energy to do, then do them. Worried your friend just wants to be left alone? Then make a point to choose things you can do without bothering them. Whatever you do, don’t just assume they don’t want help at all! 1. Cook for them. We’ve all heard that Chicken Noodle Soup is good for what ails us, so why not whip up a pot and take it over to your friend? Or drop by a homemade casserole, wrapped and ready to stash in the fridge or pop into the oven. 3. Meals in a Jar There are all sorts of shelf-stable recipes you can make and keep in Mason jars that just need a bit of water to become a meal. Find them on Pinterest, or pick up a book with Mason jar meals and keep a few on hand for just such occasions. 4. Do a load or two of laundry. Nothing is more miserable than sleeping on dirty sheets when you’re sick. Why not offer to swap your friend’s sheets for them, and put the used ones through the wash while you’re there? 5. Clean something. Kids don’t stop making messes when Mom or Dad is sick. Buzzing through your friend’s home with a vacuum and canister of disinfecting wipes can be a big help when they’re not up to cleaning. That goes doubly true when your friend is dealing with a stomach virus — at such times a freshly-cleaned bathroom is always appreciated! 6. Play chauffeur. Step in and get your friend’s kids to and from school, sports practice, and other lessons. Or take your friend to their doctors’ appointments, so they don’t have to struggle with driving. 9. Take them somewhere. Bless their hearts, kids don’t always know how to keep quiet when Mom or Dad need extra rest to get better. Be a pal by piling the kids in your car and taking them to the park or to a G-rated movie to get them out of the house. 10. Bring them board games. Or video games. Or DVD movies. Anything to give them something to do and a bit of excitement. 11. Help out with homework. Okay, the kids may not be thrilled with this, but your friend will be. Whether it’s a head cold or something more serious keeping you in bed, it’s amazing how challenging third-grade mathematics can be when you don’t feel well. 12. Surprise them with sundaes. Want to be a hero with kids as well as sick parents? Bring over the fixings for ice cream sundaes. The kids will appreciate the sweet treat, and so will someone with a sore throat. 13. Books for the bedridden. Sometimes having to stay in bed isn’t all that it’s cracked up to be. After a while, you get tired of sleeping, tired of staring at the ceiling, and tired of the travesty known as daytime TV. If your schedule doesn’t permit other favors, dropping off a stack of the latest best-selling novels or a pile of glossy magazines will still be appreciated. 14. Something to soak in. There’s nothing like a hot bath to soothe stuffy sinuses, sore backs, or weary hearts. Fill up a basket with scented bath products and lotions so your friend can bathe in bliss. 15. Wrap them in comfort. 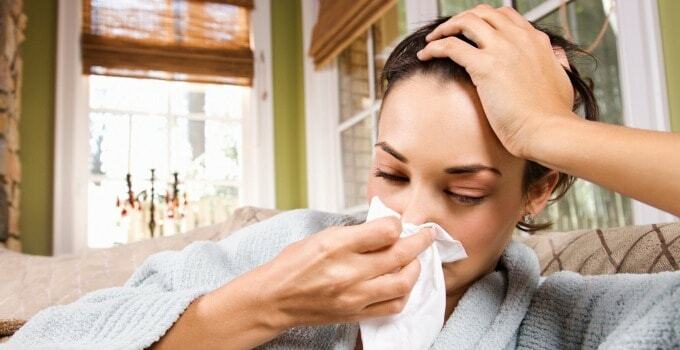 Sick people tend to stay in their pajamas. A new pair of cozy, cute ones is always appreciated. Not sure of their size? Give them a robe or a super-plush throw blanket, instead. 16. Let them eat cake. Popping in with a sweet, decadent, single-serving treat that’s just for them is a wonderful way to pamper your friend. Think: a cupcake from their favorite bakery, a small box of chocolates (the good kind), or an extra-large (decaf) latte for your friend who usually never goes a day without one. 17. Just you being you. Social isolation is a real risk for people facing long-term illnesses or injuries. While your friend might not be able to get out of the house, they still need interaction with other adults. Hanging out together, whether you’re watching movies or just talking, can keep your friend’s spirits up through whatever they’re facing. Remember, sometimes people are afraid to ask because they don’t want to seem like a burden. Other times, they just don’t feel well enough to think of the ways they need help. 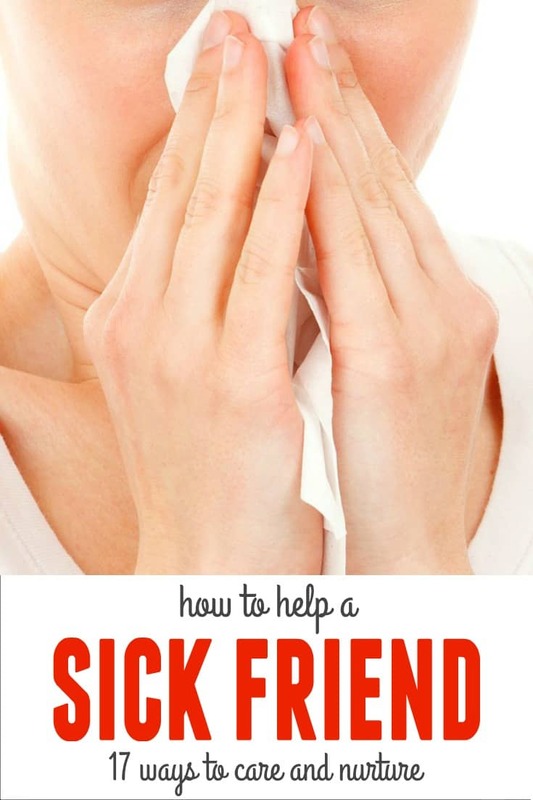 But it just takes a little time and effort to think of ways to help a sick friend. With this list, you’ve got some ideas to choose from — find a few that fit your schedule and finances and be proactive about doing them. Feeling cared for by the people we care about is a great medicine all its own. This is such a super list. I can tell you put a lot of thought into it and I will pin and bookmark it just in case. Thank you! Thank you for the kind words, Tracy, and for the Pin, too!